London: With each passing day, World Cup 2018 is becoming even more harder to pin down to easy narratives and multi-tournament trends. This is a nightmare for the content mills that churn out viral stories, but a boon for this tournament that doesn’t cease to surprise. Brazil marches ahead not on the strength of Brazilian flair football but the strength of its defensive solidity. The Seleção have conceded just one goal so far—when Stephen Zuber took advantage of a clear lapse in defensive organisation, found himself unmarked, and headed in an equalizer for Switzerland for the teams’ opening match on 17 June. By this stage in the 2014 World Cup, Brazil had conceded three goals in four matches, before conceding eight more in the quarter- and semi-finals. Meanwhile Uruguay, who came into the tournament with a reputation for rough football, have so far earned just a single booking after four matches, all of them wins. Rodrigo Bentancur’s yellow card during the course of Uruguay’s 3-0 thumping of Russia remains the only blot on their disciplinary record. The contrast with their 2014 World Cup campaign cannot be starker. Four years ago, Uruguay earned three yellows and one red by the end of their opening match against Costa Rica which they lost 1-3. The Uruguayans went on to get booked in every single match right up to their elimination at the hands of the Colombians in the round of 16. It is impossible to predict what will happen next. Belgium and Croatia were both taken to the wire by far less fancied opponents, and appear anything but invulnerable. And what will Russia pull off in their next match? Then there is England. With each passing day of knockout matches, England’s decision to settle for second in their group appears to vindicate itself. Indeed the idea that England can now power through the “weaker half of the draw" is of a piece with the notion that teams can start slow and then accelerate as the World Cup winds through the knockout stages. However, English fans will do well to keep an eye on one persistent trend in previous World Cup tournaments: not since 1982 has a team gone on to win the tournament without having topped its group. In 1982, Italy barely scraped through to the second group stage of the World Cup, after having drawn all three of their matches. Despite getting the same number of points as the Cameroonians, the Italians went through on goals scored. The 1982 tournament had a second round-robin group stage, and it is here that the Italians sputtered into form. 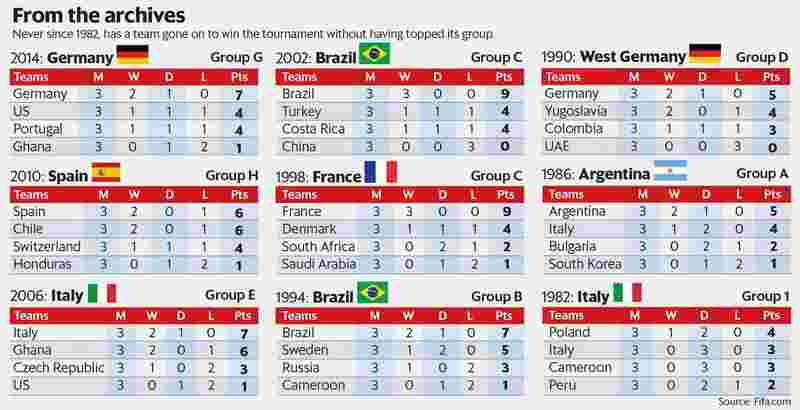 Drawn into a group with Argentina and Brazil, the Italians were not favoured to go through. Indeed a match-fixing scandal had severely tarnished the team’s reputation at home. But victory against Argentina and the return of Paolo Rossi from a ban, energized the team. In the final match of the second group stage, the Italians faced a magnificent Brazil who only needed a draw to top the group and go through to the semi-finals. The match that took place is often considered the greatest World Cup contest of all time. A contest in which the Italian system went to battle against the Brazilian magic and emerged as victors (3-2). Years later, one of the Brazilians who played in that match called it the night that football died. In a typically sweeping splendid piece for The Guardian Jonathon Wilson, demurred with this assessment somewhat: “It may not have been the day that football died, but it was the day that a certain naivety in football died; it was the day after which it was no longer possible simply to pick the best players and allow them to get on with it; it was the day that the system won." That is what it took for slow starters to win the World Cup the last time a non-group-winner lifted the cup. England’s World Cup so far has been a shade or two better than adequate. Such has been the unpredictability of the World Cup that a thumping England win, an edgy Colombian success or a match decided via penalties will all make equal “sense". Any of those results will make for equally self-evident “narrative". In that sense, English fans can take succour from the trend-busting results in Russia. This is a World Cup in which trends and narratives are re-written each day. Momentum, history suggests, is essential for a successful World Cup campaign. English fans will hope that England have enough, but if they lack it, then surely this is the World Cup that re-writes the momentum trend.